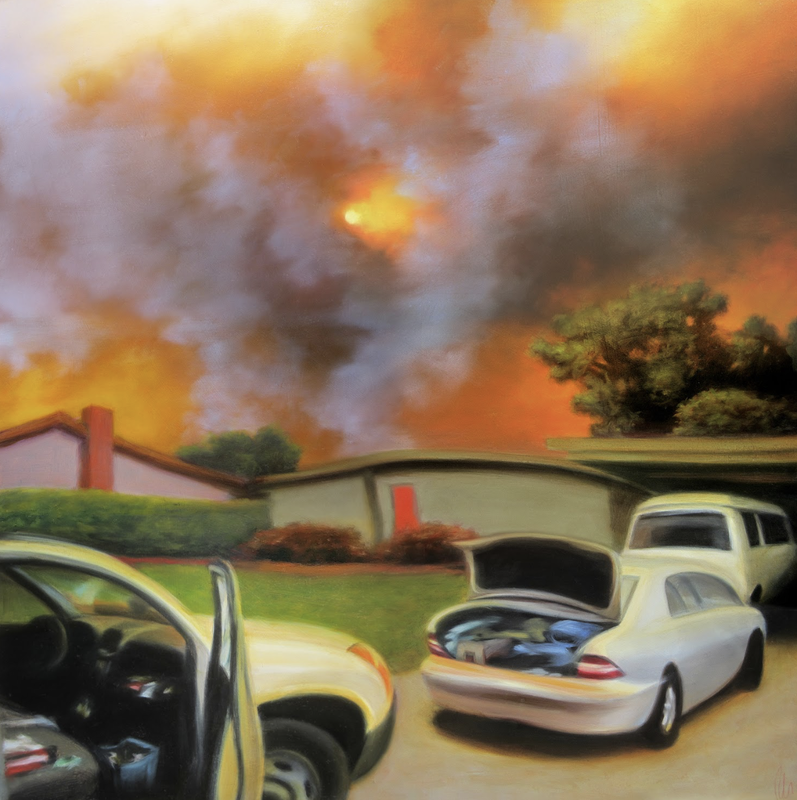 FROM THE FIRE is a collection of stories, interviews, poetry, photographs and artworks created by the Ojai community in response to the Thomas Fire. The fire started on December 4th, 2017 as a result of downed power lines in an 80 mile-an-hour wind storm. By the time it was all said and done 281,893 acres or 440 square miles had been burned, two people were dead and and thousands had lost their homes. The rains that followed resulted in even more loss of life and property in Montecito and Santa Barbara County. It was in the midst of this tragedy that we felt the call to create a book which would memorialize both what was lost and also what we as a community have created as a result of the fire. This book has taken over 9 months to complete as we have sifted through 900 photographs including images of original artwork, over 40 essays and poems and interviewed over 45 Ojai community members. The outpouring of love and grief has been profound. Scroll down to learn more about each body of work. Deva: Almost a year ago I traveled back to my hometown of Ojai to assist my mother during the Thomas Fire. She was evacuated and we didn't know if her home would burn or not. If it did, I didn't want her to come home to the ashes alone. I ended up being one fo the first people back in the Canyon as the fire was still burning. I got to meet and thank the men who saved her land. On my way out I saw a metal treasure chest sitting out in the middle of nowhere, a place where there had been 30' tall vegetation just a couple days earlier. I stopped my car and walked out to see what was inside. There I found a stack of papers reduced to ashes, still intact. I stood and stared for a long time wondering whose life these were remnants of. A mystery I will likely never solve. In that moment I had this flash. I saw how much beauty and grief and heart-full community and devastation and hope was being left behind by this fire and I wanted to document it by creating a book of photographs. A friend I did not yet know, Elizabeth Rose, was across town having the same idea but instead a book of poetry and reflection. We connected around this shared dream and together we collected the stories, poems, photographs and artwork of a community, our community, beloved Ojai. This is that book. After months of work, many tears and a little laughter, we are ready to unveil. Elizabeth: A week after the start of the Thomas Fire I created a Facebook page—Writing From The Fire. The hope was to capture all of the many beautiful poems and prose that were being shared of the Thomas Fire. Writings sharing loss and possibility, grief and support, love and gratitude and always fire were scattered throughout Facebook and I wanted to collect them in one place and possibly create a book in honor of our resilient community. I invited people to share your writings which can be more than just the written word. Paintings and drawings, photographs and lyrics, these too are words from within. Whatever your medium, please share your expression here. Shortly after, I came across a post from Deva expressing her desire to create a photography book and, though we did not know each other yet, I reached out. Either you read my mind or I read yours, I wrote and asked if she would like to create this book together. FROM THE FIRE was born. ​We have worked together now for almost a year, culling through the beautiful photographs and artwork, writing and reflection. And as we created this beautiful book we nurtured a beautiful friendship. A friendship born of fire. The interviews are a collection of conversations with over 45 members of the Ojai community, representing a cross section of organizations and businesses, along with individuals sharing their own, unique experience through the Thomas Fire. The same questions were asked: what was happening when the fire started, where did you go and what did you do, and how did you feel? The conversations were recorded and then transcribed with the intention of keeping the lilt of the voice, the rhythm of the sentence, the essence of the speaker. The goal was to capture who each person is along with honoring their story and offering the reader the many different experiences and perspectives of the Thomas Fire. ​The collaboration with Deva and the making of FROM THE FIRE is preceded by an eclectic background. Elizabeth is an attorney with a mediation practice helping couples to end their marriage while sustaining their family. She is an editor and works with other writers to ensure that their words are clear and strong. And she writes a popular blog— IveJustGottaSayThis. com—that captures the life of a midlife woman. Elizabeth is a Mother, Partner, Friend, Sister, Daughter, Dancer, Dog and Cat Lover. She grew up in New York, raised her three children in Massachusetts and she currently lives in Ojai with her husband, her soul dog and her spirit cat. Along with her work on this book, Deva teaches yoga-informed, bodyfocused trauma transformation and leads grief integration rites of passage as well as offering lifestyle courses on authenticity, self love and self actualization. Her writing can be found online at BlissfulWomanhood.com and at HerHeartSpeaks. com. Her work straddles and integrates three worlds: the personal, the collective and the transcendent. Deva holds a BA in Psychology from Lewis & Clark College and an MA in Global Leadership and Sustainable Development from Hawaii Pacific University. She grew up in Ojai and currently lives with her husband, four dogs and many chickens in Ashland, Oregon. While we connected right after the Thomas Fire began, the process of creating this book really started in February, 2018. We found that while photographs and writings, images of artwork and poetry were coming to us in response to our request for submissions, the Ojai community was still deep in fight or flight and needed time to integrate the experience into themselves; the two months until February was a necessary time of self care and self reflection. And then the submissions began to roll in. For many months, we met weekly—a Monday Zoom call—and culled though the past weeks gifts. Each photograph told a personal story, each writing brought forth, with open heart, a unique experience just as it captured the experience of the whole. The process of reviewing everything that we received was beautiful and painful and we were grateful every day that we were able to hold this space and cultivate this project. In May, we met in person for the first time when Deva came to Ojai to visit her and her husband's family. At this time most of the photographs were received and every writing—whether poem or prose or interview—had been edited by three different pairs of eyes—members of the Ojai community who offered their time to support our project. And then in July, Elizabeth flew to Ashland for a week so the two could begin to design the book. Elizabeth had previously met with a number of local printers in Ventura and Santa Barbara and chose V3 Printing in Oxnard as their printer. She arrived in Ashland as a fire threatened the town with a blank-paged mock up of their book showing the size and quality that FROM THE FIRE would become. The week was spent reading and discussing the writings, reviewing the photographs, deciding on margin size, font style and size, and overall design layout. Elizabeth also spent the week inputting each writing into the book in the chapter it belonged in. And then Deva began the creative process of laying the photographs to tell the visual story of the Thomas Fire. We truly did align with the vision we first had of creating a book when we look at what we were drawn to in creating this book. The writings were Elizabeth's thing—how they were written, where they were placed, the order of the stories, and for Deva—working with the photographs, aligning story with image, creating a two-page spread of color and image that flowed together in the most beautiful way: we both gave to different parts of this book, and complimented each other so well, and what transpired is this amazing anthology of our town's experience with the Thomas Fire.